In November 2009 we held a rare opportunity to meet and celebrate the work of an iconic figure of the Arts. 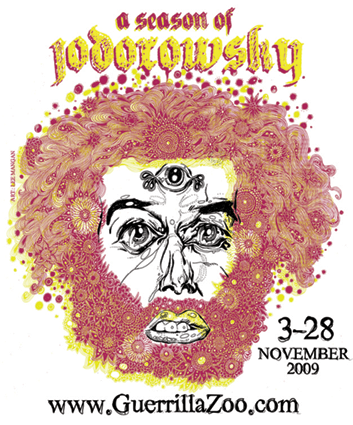 A season crystallising the work of visionary and cult figure Alejandro Jodorowsky is being presented through theatre, film and music at prestigious venues in London throughout November 2009. Legendary film maker, playwright, actor, mime, comic book writer and psychotherapist. His work is powerful, provoking and often controversial. It transcends the conventional, taking the viewer (in the case of his films) and reader (in his books and comics) to unfathomed depths, touching subjects most would never dare address. Alejandro is great inspiration to many generations of artists; Directly influencing musicians such as Marilyn Manson, Peter Gabriel, Company Flow & Kasabian. Fans include directors David Lynch, William Friedkin and Samuel Fuller, actors Peter Fonda and Dennis Hopper, and performers Bob Dylan, George Harrison, MGMT, Balkan Beat Box, John Lennon & Yoko Ono, amongst countless others. Alejandro Jodorowsky is one of the last remaining, completely original, boundary demolishing, artist’s that changed a generations mindset and who’s work is still as strong, relevant and as vividly striking today. Guerrilla Zoo believes it is time he is fully recognised for the enlightened genius creator of worlds, that he is! So we have curated a whole season exploring all aspects of the man himself. For more information on his works, influences, films please check out Alejandro Jodorowsky's biography.